“The Third of May” is not a happy painting. In fact, when it was completed in 1814, it was arguably the darkest and most haunting work of art ever created about war. But, for the artist who used the painting to avoid a visit to the Inquisition, the iconic image has a sunnier side. Francisco José de Goya y Lucientes was born March 30, 1746, in Fuendetodos, Spain. The son of a gilder, young Francisco didn’t grow up in the wealthiest of families. He did, however, know how to network. Living in the city of Zaragoza, Goya began apprenticing at age 13 with a family friend who’d trained as a painter in Naples. The relationship bolstered Goya’s passion for the arts, and he spent the next decade pursuing a career in painting — although his efforts were largely unsuccessful. It wasn’t until Goya married Josefa Bayeu at age 27 that his career finally took off. Josefa’s brothers, Ramón and Francisco, were already established painters in Europe, and the new family connection boosted Goya’s career prospects. He soon joined his brothers-in-law in Madrid and worked in the royal tapestry factory. Within a few short years, Goya landed a series of breaks that solidified him as a major artist. In 1780, he gained admission to the prestigious Royal Academy of Fine Arts (which had rejected him twice previously), and by 1783, he’d earned the coveted commission for a portrait of the Count of Floridablanca. Impressed with Goya’s work, other high-ranking officials began turning to him for their portraits. Spain’s King Carlos III hired him full-time in 1786, and three years later, his successor Carlos IV promoted Goya to court painter. Goya was far from a simple portrait artist, though. Critics have always marveled at his ability to turn what could have been mundane profiles into lasting masterpieces. His talent for revealing a subject’s flaws without caricaturing them makes Goya’s portraits strikingly unique to the era. It also helped him become popular with the upper class, giving him the long-awaited stability and financial success he’d been seeking. As Goya’s professional life started to look up, his personal life took a serious downturn. On a visit to a patron in Cádiz in 1792, he fell terribly ill. “I can stand on my own feet, but so poorly that I don’t know if my head is on my shoulders,” he wrote to a friend. “I have no appetite or desire to do anything at all.” Nobody has been able to determine the exact cause of Goya’s illness, but it left him completely deaf at age 46. From that point on, Goya’s work acquired an increasingly macabre tone. His paintings featured dark scenes of shipwrecks, bandits robbing coaches, and prisons full of madmen. “The Witches’ Sabbath” (1797–98), for instance, depicts a group of women offering stolen babies to a giant black goat that represents the devil. Around the same time, Goya began one of his most ambitious projects—a series of 80 wickedly satirical etchings known as “Los Caprichos.” Targeting what he called society’s “innumerable foibles and follies,” the pieces so successfully exposed the political and religious abuses of Spanish officials that he was pressured to remove them from public sale after just a few weeks. Many of his caricatures were recognizable jabs at well-known institutions, and it’s been said that the king had to intervene to save Goya from the Inquisition. Goya’s personal life was beginning to match the political situation surrounding him. In 1807, Napoleon made a deal with Carlos IV to allow French troops into Spain on their way to invade Portugal. But that decision backfired when Napoleon used it as an opportunity to overthrow the country. When word got out on May 2, 1808, that Napoleon’s brother Joseph was the new king of Spain, civilians erupted in protest. They staged numerous attacks against French troops, but were brutally put down almost every time. During the French occupation, Goya had to earn a living by painting whatever commissions he could get — and that included portraits of French officials. Formerly the artistic darling of the Spanish crown, Goya now earned his keep by painting the likes of Joseph Bonaparte. It’s no surprise, then, that when Napoleon was defeated and Fernando VII (Carlos’ son) reclaimed the Spanish throne in 1814, the artist needed to clear his name from accusations of collaboration. To prove his loyalty to Spain, he produced two paintings that celebrated the resistance. The first was “The Second of May, 1808: The Charge of the Mamelukes.” The second was “The Third of May, 1808: The Execution of the Defenders of Madrid” – a stark scene of execution and defiant resistance that still stands as an unmistakable ode to Spanish patriotism. Those two paintings helped Goya avoid persecution. The Inquisition did charge him with obscenity for his earlier painting, “The Naked Maja” (circa 1797–1800), which meant his days as a court painter were effectively over, but he escaped relatively unscathed. Already widowed, Goya moved to the outskirts of Madrid in 1819, where he settled into a farmhouse (ironically already known as Quinta del Sordo, “the Deaf Man’s House,” due to the previous owner’s affliction). It was here that Goya, suffering another period of ill health, created his so-called “Black Paintings” (1819–1823). If “Los Caprichos” were dark comedies for the masses, the “Black Paintings” — named for both their color scheme and subject matter — were personal nightmares. The seminal work of the series, “Saturn Devouring His Son,” shows a deranged, mangy deity tearing into flesh. The 14 pieces evoke Goya’s earlier paintings of insane asylums and cannibals, yet constitute the greatest examples of his later work. After four years in the countryside, Goya decided to flee Spain and Fernando’s increasingly dictatorial rule. In 1824, he petitioned the king to let him take medical leave in the south of France, claiming the hot springs there would benefit his health. Fernando, who never much cared for Goya’s work or politics, granted him exile. Goya spent his final years in Bordeaux, where he lived with his mistress and her daughter. He continued to paint and draw but returned to his earlier, more realistic style, focusing on mainstream subjects such as bullfighting and portraiture. Goya died on April 16, 1828, two weeks after a stroke paralyzed his right side. At the then-remarkable age of 82, he laid claim to more than 700 paintings, 900 drawings, and 300 prints. 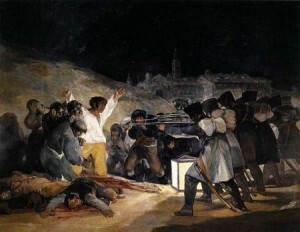 A Sense of Place: French soldiers executed Spanish patriots at several locations that day, but Goya chose to paint the shootings at Príncipe Pío hill in western Madrid. One of the city’s highest points, it’s recognizable because of the palace on the right-hand side, which sustained considerable damage during the uprising. A Bright Idea: The main figure in the painting is dressed like an average Spanish worker, and his yellow-and-white clothes jump out against the dark background. But if you look carefully, you can see the cube-shaped lantern that bathes him in an eerie light, as though Goya is shining a spotlight on the victims rather than the perpetrators. Standing Tall: Goya’s peasant hero is kneeling, with his arms outstretched in a reference to crucifixion. (On his hands are subtle, stigmata-like wounds.) The bloody corpse in the foreground lies with his arms in the same pose. Both reflect heroic defiance. Masked and Anonymous: The painting’s composition follows two diagonal lines — the individualized patriots and the faceless firing squad. The French soldiers are identical and indistinguishable, with the same uniforms, hats, poses, and swords at their sides, as though unworthy of personal traits. No tale of Goya’s woe is complete without a discussion of his mysterious deafness. Doctors never could diagnose the cause of his illness, and his treatment consisted mostly of extended bed rest. (If you’re wondering how much that annoyed Goya, note that his “Caprichos” series includes an etching of a doctor represented as a clueless donkey in human clothes.) The cause of his hearing loss is still a mystery, but that hasn’t stopped people from proposing various theories. Among them? Syphilis, a then-untreatable scourge, and Meniere’s disease, a disorder of the inner ear that matches Goya’s symptoms of dizziness and ear-ringing. But another theory suggests lead poisoning. In 1972, Dr. William Niederland proposed that Goya’s symptoms (which included partial paralysis, speech impairment, and hallucinations) were all consistent with lead poisoning from some of the paints he used. But until someone invents time travel, nobody will know for sure.